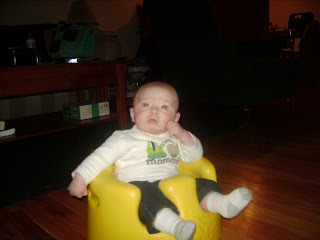 My Flashback Friday Free For All is the Babies in Bumbo's gallery. 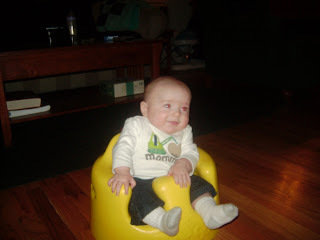 I had some new pics of David in the Bumbo that I hadn't posted yet, so I had to go look at the the other baby bumbo pics so I could laugh at them again. I figure everybody can use a good laugh so thought I would share. 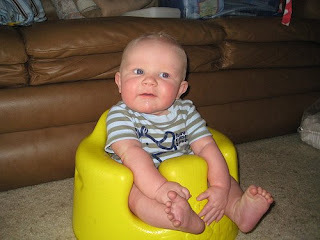 Now I think the Bumbo is the silliest piece of baby equipment ever invented. The Tattooed Mama recieved this as a gift from one of her friends who assured her that babies love them. But I think they are more for the amusement of adults. The only purpose they seem to have it to sit the baby in them and take some hilarious pictures of the baby with a WTF look on their face and pass the pics around for everyone to laugh at. I would not exactly classify that as child abuse, but... exploitation? And then you pass the Bumbo on to the next person who has a baby and they can send you some pics of their baby for you to laugh at. Morgan: Whoa, are you sure this thing is safe? Morgan: I've fallen and I can't get up! Abby: Say, could you pass me another shot? Carter: Are you laughing at me? Carter: Yeah, and I'll get you back for this some day. David: Wait, I have to think about this. David: Oh, I get it now, come on horsey, giddy up! Why isn't it going? Hope you enjoyed the gallery of Bumbo Babies. 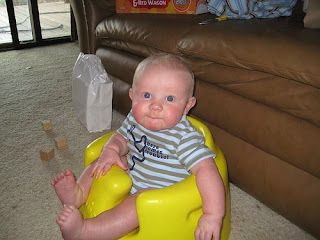 Have a good caption or a good bumbo baby pic? Please comment! And visit Ann Glamore's My Tiny Kingdom to see more Free For All Flashback Friday Posts! I laughed until I cried. 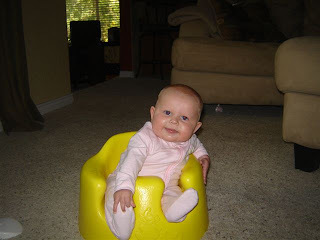 I fear that they will develop a bumbo seat for adults, and grown childen will get their revenge.